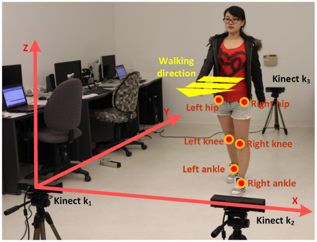 we develop an integrated markerless gait tracking system with three Kinect v2 sensors. A geometric principle-based trilateration method is proposed for optimizing the accuracy of the measured gait data. To tackle the data synchronization problem among the Kinect clients and the server, a synchronization mechanism based on network time protocol (NTP) is designed for synchronizing the server and Kinect clients’ clocks. Furthermore, a time schedule is designed for timing each Kinect client’s data transmission. In the experiment, participants are asked to perform a 60-s walk, while the proposed tracking system obtains the participant’s gait data. Six joints (including left hip, right hip, left knee, right knee, left ankle, and right ankle) of the participants are tracked where the obtained gait data are described as 6000 movements of joint positions (1000 movements for each joint). The results show that the trilateration tracking result by the three Kinect sensors has a much higher accuracy compared with the accuracy measured by a single Kinect sensor. Within a randomly sampled time period (67.726 s in the experiment), 98.37% of the frames generated by the gait tracking system have timing errors less than 1 ms, which is much better than the default NTP service embedded in the Windows 8.1 operating system. The accuracy of the proposed system is quantitatively evaluated and verified by a comparison with a commercial medical system (Delsys Trigno Smart Sensor System). Lin Yang, Longyu Zhang, Haiwei Dong, Abdulhameed Alelaiwi , and Abdulmotaleb El Saddik, “Evaluating and Improving the Depth Accuracy of Kinect for Windows v2”, IEEE Sensors Journal, Volume 15, Issue 8, pp. 4275-4285, 2015.